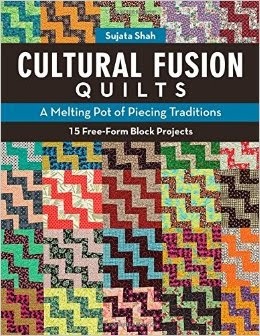 I can't wait to see Sujata's new book: Cultural Fusion Quilts. You know Sujata's wonderful quilts from her blog: The Root Connection. She makes maverick quilts in the liberated tradition with awesome colors. Yayy, Sujata! I like the term - 'Liberated tradition' too. The book is filled with free-form traditional blocks and it's freeing with lot of possibilities for new and experienced quilters. Thank you for the shout out. Awesome colors, for sure! Sujata is a color wizard.